SANTA CRUZ >> The dancing has already begun, but the party is just getting started. Some 49 scheduled “Dancing in the Streets” performances on three stages along Pacific Avenue Thursday night kicked off the annual National Dance Week Santa Cruz. At three “stages,” large sheets of plastic stretched across the roadway, dance routines ranging from the tango and ballroom dance occurred simultaneously with Brazilian and aerial numbers in 10-minute snippets. Early in the evening, a Pacific Arts Complex ballerina’s pink layered skirt, fringed in black lace, ballooned above the dancer’s long legs as she rapidly circled atop feet balanced on tip-toe. The crowd around her, cameras flashing and record lights blinking, stood two deep in a ring. One stage over, a troop of Te Hau Nui School of Hula and Tahitian Dance performers, wearing green wreaths on their head and bare feet beneath long dresses, clapped short sticks against longer ones, mouthing the words along with their leader’s chant. On Thursday, Soquel dancer Vin Tong, who was not performing this year, avidly watched a performance on Cooper Street, greeting other dancers. He said the event is important to expose people to the “very varied” styles of dance available. The celebration will segue into open studios at dance studios across the city in the coming week, and an open flash mob event Friday night. Elaine Pineres of San Jose ventured over the hill for Thursday’s celebration to support her instructor and the local belly dancing community through a joint performance. Though she has been partaking in a variety of dance styles her whole life, it was not until a National Dance Week celebration six years ago that she ventured into belly dancing, she said. “Santa Cruz has their own flavor of it, where they offer dancing in the streets,” Pineres said of the national event. “It’s free. Kids are running around. It’s very loose and very welcoming and people get to experience all kinds of dance that they never would think of coming to see, had they bought tickets and gone to a theater. Marlene Rosburg of Santa Cruz has come to each of the local dance weeks to see her young granddaughter perform, she said. Rosburg said the 9-year-old takes classes at four studios in town and was scheduled to dance in three performances Thursday night. Continuing into the weekend, the celebration will feature its first all-inclusive performance opportunity on Friday. Interested participants are invited to gather at 6 p.m. behind Dance Motion, 131 Front St., in preparation for an 8 p.m. performance. No technical experience is needed to take part in the Flash Motion Mob, organizers said. Further into the weekend, an extensive listing of open studio classes are scheduled, and a “Dance in Unlikely Places” program is scheduled Friday through Sunday. The offering features dance outside the boundaries of a concert, stage or theater, from crosswalks to bus stops, bridges to buildings. 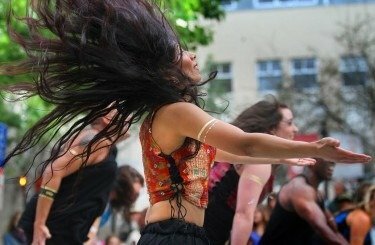 To see a schedule of events for Santa Cruz Dance Week, visit scdanceweek.com/events online.